North Korea, reportedly, is stepping up efforts to develop scientific technology for economic revival while at the same time working to bring stabilization to the new government led by Kim Jong-un for three years since he took office as first secretary of the ruling Workers’ party. In particular, the North is reported to show much interest in electronic payment systems appearing in the global market. It is well known that Kim Jong-un in his early 30s, who directly experienced the information and communications revolution, has put a lot of efforts into technology development in the field of information and communications technology. “North Korea is keenly interested in electronic payment systems such as PayPal,” said Park Chan-mo (79), an honorary president, who teaches students in Pyongyang University of Science and Technology, in an interview with the Maeil Business Newspaper. He elaborated on the changing North Korean society during the three year regime of Kim Jong-un. 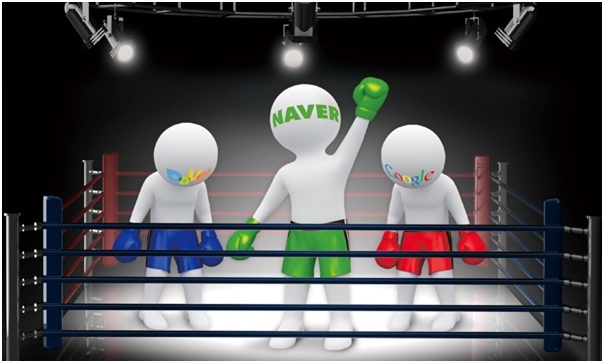 Most Koreans today use Naver, which has 70 percent of the portal market, or Daum, which has 20 percent. Portal market share is based on the number of searches performed. Although Google and Yahoo are Internet search engines and portal sites that are globally competitive, they have failed to catch on in Korea. Google ranks a distant third, and Yahoo Korea closed up shop in December 2012. When it began in 1997, Yahoo Korea established itself as a leading domestic portal site, at one time ranking first in visitor numbers. However, its market share declined drastically after 2000, until it was knocked out of the top 10 in September 2012 with a share of less than 1 percent. Korea is one of five countries, along with China, Japan, Russia and the Czech Republic, where Google has failed to dominate the Internet search market, according to a survey released by Democratic Party lawmaker Yoo Seung-hee. Google entered the domestic market in March 2001. Google operates in 50 countries and has 82 percent of the world’s portal market. Yet it has only managed to gain a share of 3 percent in Korea, according to Nielsen KoreanClick, an Internet research and consulting firm. As of November, Google had 11.4 percent of the domestic mobile portal market compared to Naver’s 70 percent and Daum’s 13.4 percent. Can Samsung build its own ecosystem with Tizen? Samsung Electronics has emerged as a global corporation commensurate with U.S. technology giant Apple but a weakness in software is still the Korean firm’s Achilles heel. The world’s largest electronics maker by revenue is now first in market share and annual shipments of smartphones and total handsets, thanks to the popularity of its Galaxy series. 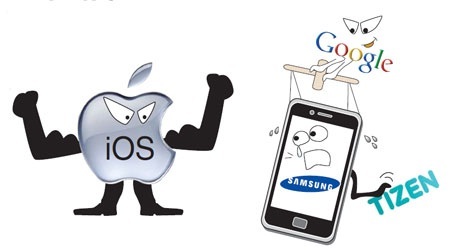 Now it hopes to expand to software with its own operating system (OS), Tizen. The firm will showcase a high-end phone running on the OS to clients at the Mobile World Congress to be held in Barcelona from Feb. 25 to 28, though the event won’t be open to the public. Samsung is beating Apple on the hardware front, backed by smartphones with high-quality, large-sized screens, which are its most valuable asset, according to mobile chief Shin Jong-kyun. But its software ecosystem is, to put it mildly, meager compared to its California rival. 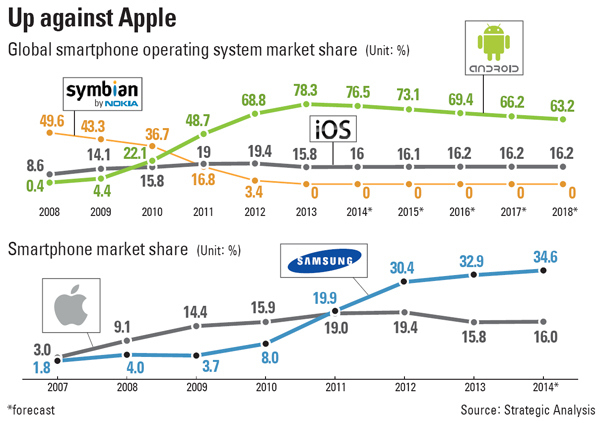 Since smartphones first touched down in Korea with the arrival of the iPhone 3GS in late 2009, the market has seen exceptional growth. By the end of this year, the industry estimates 34.8 million people in the country will own a smartphone given the recent release of Samsung Electronics’ Galaxy S3 and the upcoming launch of Apple’s iPhone5. The wide use of mobile gadgets has not only inspired the related advertising market to expand, but is also changing the way consumers here make purchases. The Korea JoongAng Daily puts the domestic mobile ad and shopping market under the microscope. NHN Corp. is restructuring its business to focus on the mobile market as more Koreans give their PCs the cold shoulder in favor of Tweeting, KakaoTalk-ing, Facebook-ing and generally surfing the Web on their mobile devices and smartphones. To profit from this shifting trend, the nation’s leading Internet content operator launched its mobile ad platform late last month to lure advertisers following a successful trial run. South Korea’s major internet providers KT, SK Broadband, and LG Uplus agreed to charge key internet portals such as Naver, Daum, and Google for use of their networks. As smart TVs and internet-based video services gain momentum, network providers are looking for ways to share the burden of rapidly growing data traffic, say experts. Korea’s main network operators and the Korea Telecommunications Operators Association (KTOA) reached an agreement on a scheme designed to impose network fees on major internal portal sites and published a guideline on the price-sharing scheme, said industry sources Wednesday. In essence, the guideline calls for the application of interconnection fees used in telecom networks to the internet as well. The exact fees have not been set, but the most likely pricing will be between 75 won to 100 won ($ 0.09) per gigabyte (GB). Foreign firms like Google, owner of Youtube, and Apple which runs a successful platform business will be charged through other methods such as legal claims for profit-sharing.